What is the Bring Your Own Device (BYOD) program? The BYOD opened for all students in grades six through 12 in September 2013 and for teachers in grades K-5. 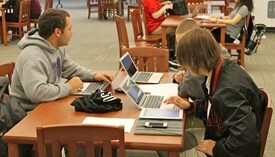 BYOD permits students and teachers to bring their own devices to school and connect to the Newark City Schools network. What are the Hardware and Software Considerations? Students may use devices that fall into the following categories: (a) laptops, (b) netbooks, (c) tablets, and (d) e-Readers. In some instances, teachers may allow the use of MP3 players or Cell phones/Smartphones. Newark City Schools provides a wireless network which students may connect to while using their devices in the building. Additionally, students may use an Internet connection from an outside provider. In this case, the family will be responsible for any expense incurred using this type of Internet connection. We recommend that devices are charged at home. Any charging station availability will be determined on a school by school basis. Buying a computer is a personal choice. Ultimately, each person will need to choose the device that works best for his/her child. All lessons will be based on Internet access, so the only hardware requirement is the ability of the device to connect wirelessly to the Newark City School’s network. Any type of tablet, netbook, or laptop can be used. Whichever you choose, the device must be able to connect wirelessly to Newark City Schools network. No software needs to be purchased. Access to productivity tools (For example: word processing, presentation, and spreadsheet software) will be provided. Newark City Schools will not provide the technology support staff to repair or update personal computing devices. Families must stress the responsibilities their children have when bringing their own computing devices to school. Any devices students bring to school are their sole responsibility. Newark City Schools takes no responsibility to search for lost or stolen devices nor is there any assumption of financial responsibility by Newark City Schools for damaged, lost or stolen personal computing devices. Does Newark City Schools suggest any other considerations? It is suggested you consider contacting your insurance provider for recommendations regarding any additional insurance. If purchasing a new device, it is suggested that the extended warranty be purchased. Many lessons are collaborative, allowing students to work together, sharing information accessed through personal devices. When the work is individual, students may use computers and other devices located in classrooms and/or in the Media Center. No child's learning experience or academic performance will be affected because he or she does not have an Internet-connected device to bring to school. Newark City Schools is committed to reducing technology inequity so every child can learn equally. Yes. In order for the Newark City School District to clarify expectations, responsibilities and to provide a safe network environment, the Acceptable Use Policy and the BYOD Student Acceptable Use Addendum must be read and must be signed by all students who want to have access to educational resources. Parents/guardians of students under age 18 are also required to read and sign the agreement. Students 18 or older may sign the document themselves. Signing the document indicates that the student and parent/guardian have read, understand and accept the policies, procedures and expectations of the Newark City School District. Students will not be able to access printers at Newark City Schools from their personal computing devices. Where do students have permission to use electronic devices while in Newark City Schools?